Properties in Louisiana average 4.6 out of 5 stars. Classic Uptown Shotgun, just steps to the streetcar ! 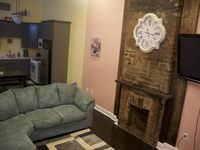 Property 1: Classic Uptown Shotgun, just steps to the streetcar ! NEAR STREETCAR LINE! NEW LOCATION!! BOOK NOW! 5 minutes from FRENCH QUARTER! Property 8: NEAR STREETCAR LINE! NEW LOCATION!! BOOK NOW! 5 minutes from FRENCH QUARTER! Live Like A Local In Historic Architecture! Property 9: Live Like A Local In Historic Architecture! Hop On The Streetcar ! Property 10: Hop On The Streetcar ! Charming Creole Caribbean in Mid City! Property 17: Charming Creole Caribbean in Mid City! Property 20: New Orleans Home w/Patio - 2 Mi to French Quarter! Spring fishing is here. Come down and catch some reds and speckled trout. Property 22: Spring fishing is here. Come down and catch some reds and speckled trout. Bayou Belle Inn in Pierre Part, La sits on Belle River water frontage. Property 24: Bayou Belle Inn in Pierre Part, La sits on Belle River water frontage. Uptown Cottage 2/2 - Steps to St. Charles Ave.
Property 26: Uptown Cottage 2/2 - Steps to St. Charles Ave.
Good for families or longer visits. Property 28: Good for families or longer visits. Great house steps from the lakefront! Property 30: Great house steps from the lakefront! Rural 3BR Clinton Home w/Patio & Fishing Pond! Property 38: Rural 3BR Clinton Home w/Patio & Fishing Pond! Get Away to Great Views, Fishing and Convenient Location. Property 44: Get Away to Great Views, Fishing and Convenient Location. Property 45: 1839 Victorian Private Large Room Sleeps two Garden District. 3/2 Home with Awesome Views and Your Very Own Private Pier. Property 46: 3/2 Home with Awesome Views and Your Very Own Private Pier. Corner lot lake front paradise!! Property 47: Corner lot lake front paradise!! Fish Camp Sleeps 7 Nestled In The Heart Of Fishing Paradise. Property 48: Fish Camp Sleeps 7 Nestled In The Heart Of Fishing Paradise. Family get away. Fishing, swimming, and boating. Unplug and spend quality time. Property 49: Family get away. Fishing, swimming, and boating. Unplug and spend quality time. Joe was wonderful to communicate with before and during our stay! He welcomed us when we arrived and made us feel right at home! A group of my friends and I came to New Orleans to attend a conference at the convention center downtown! The house is beautiful, clean, and spacious! The house has a NOLA styled charm to it that is fun and inviting! The house fully accommodated our group and we truly enjoyed our stay! Everything was perfect! I went down to Nola to celebrate my birthday and all I can say is amazing . The host was amazing and she even bought me a bottle wine for my birthday even though I forgot it lol. Everything inside of the house was modern. My only suggestion is to provide more picture to show how amazing your home is.Very quiet area also. Overall I had an amazing time.